Continued selling by foreign institutional investors amid tax concerns has cost India the most favoured emerging market tag in April. Benchmark indices ended lower for the second straight day, amid weak global cues, on losses in FMCG, IT, select financials and auto stocks as investors remained risk-averse in view of the expiry of April series of derivatives contracts. Worries over government's combative stance on capital gains tax, delay in passage of key reform-centric legislative proposals, weak Q4 corporate earnings and gloomy monsoon forecast which is likely to further dent rural demand kept the risk-appetite under check. Global cues turned weak on lower-than-expected growth in the US economy for the first quarter at 0.2%, significantly lower than 2.2% posted in the previous quarter and cautious comments from the Federal Reserve. 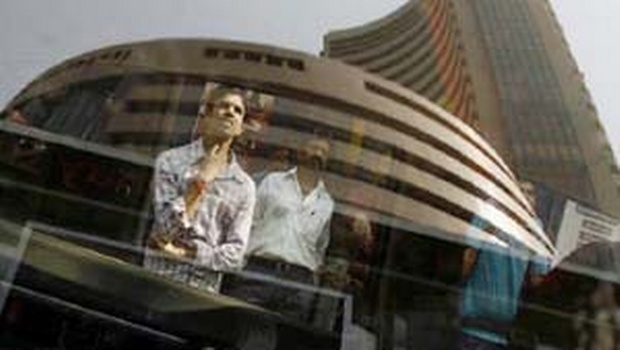 The 30-share Sensex ended down 215 points at 27,011 and the 50-share Nifty closed down 58 points at 8,182. The issue of capital gains tax took a new turn when five foreign portfolio investors (FPIs) filed a writ petition against income-tax department’s minimum alternate tax (MAT) demand in Bombay High Court today. The matter will now be heard on May 6. Foreign flows into Indian stocks so far this month are $1.8 billion, much lower as compared to peers South Korea ($3.9 bn), Taiwan ($3.4 bn) and Brazil ($2.3 bn), show data from Bloomberg. The markets are shut on Friday on account of Maharashtra Day. In the broader market, both the BSE Midcap index ending flat and Smallcap index, closing down 0.1% performed better than the front-liners. Market breadth in BSE ended negative with 1,387 declines against 1,305 advances. Meanwhile, foreign institutional investors were net sellers in Indian equities worth Rs 718.31 crore on Wednesday, as per provisional stock exchange data. In the May series, the Nifty can witness a reversal in its current negative trend as a pattern of bottom out formation is seen at its multiple supports of 8,145-8,160 zones with short covering activity, analysts say. "Now, the index needs to cross and hold above 8,340 to witness a bounce back move towards 8,550-8,635 levels. However, if it fails to hold 8,145 levels, then weakness may continue towards the 8,000 levels," said Chandan Taparia, derivatives analyst (equity research) at Anand Rathi in a post market note. "Among sectors, Capital Goods, Cement, Telecom, Metals, Oil & Gas, FMCG, Infrastructure and Banking topped the sector-wise rollovers. Lower rolls were seen in Realty, Media, Fertilizers and Automobiles sector stocks," he adds. Seven out of the 12 sectoral indices of BSE ended lower. BSE Metal and FMCG indices down 1.6% and 1.2% each were the top losers followed by BSE Auto and IT indices, down 1% and 0.8% each. BSE Realty index up 1.5% was the top gainer. Axis Bank was among the biggest gainers in today’s session and ended up 3.1%. Axis Bank has extended its previous day's gains after the bank’s net profit grew 18% to Rs 2,181 crore on the back of a 20% in net interest income and 21% increase in other income. RIL gained 1.6% and ONGC ended down 0.6% on government’s decision to ease the norms of gas field development as this move is likely to benefit the oil and gas exploration companies. Among pharma stocks, Cipla gained 1.4%, Sun Pharma gained 0.4% and Dr Reddys Lab was down nearly 2%. In its clarification to BSE, Sun Pharma has neither substantiated nor confirmed the media reports which said that the pharma major is considering spending upto seven billion dollars on mergers and acquisitions. Housing finance major, HDFC lost around 2% extending losses since yesterday after it posted marginal 8% growth in standalone net profit for the March quarter at Rs 1,862 crore. HDFC Bank ended flat and ICICI Bank gained 0.6%. According to media reports, HDFC Bank has sold loans worth Rs 550 crore of Essar Steel to asset reconstruction companies at a discount of 40%. SBI lost 0.8%. SBI has signed an MoU with National Insurance Company to roll out accidental death and disability cover for savings bank holders covered under the Pradhan Mantri Suraksha Bima Yojana. FMCG majors, ITC and HUL have shed around 1.8% and 0.7% each while the selling-pressure on IT stocks has grown in strength after US economy grew at a surprisingly low rate of 0.2% in the first quarter. The US is the major market for frontline IT companies. Infosys declined 0.9%, Wipro ended down 0.2% and TCS dropped 0.5%. BHEL has successfully commissioned the first 500 MW unit at the 2x500 MW Chandrapur Super thermal Power Project of Maharashtra State Power Generation Company Limiied in Maharashtra. The stock ended down with gains of nearly 3%. Bharti Airtel ended down nearly 2% after the consolidated net profit fell 12.6% to Rs 1255.3 crore in the March quarter compared with Rs 1436.5 crore in the December quarter. Auto stocks like Tata Motors, falling for second straight day and M&M declined over 2% each. Media reports have cited CEO of Italy's Pininfarina saying that the car design company is yet to reach an accord with M&M over a possible sale.